Perfectly grilled steak served sliced in a sandwich with caramelized onions, creamy blue cheese and arugula tossed in a balsamic vinaigrette. Over the last few weeks I have been enjoying a lot of dishes made with seasonal ingredients but I was recently distracted when I came across the the idea of a black and blue salad. 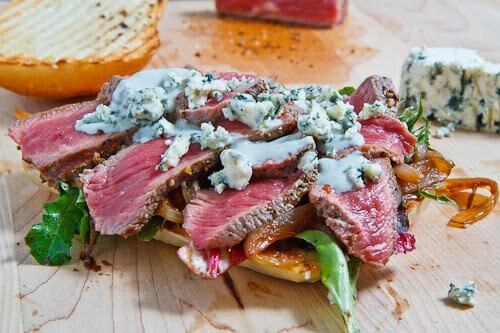 The black and blue salad gets its name from the grilled steak, which is the black component, that is combined with blue cheese in the salad. I would almost never pass up on some perfectly grilled steak and I am an absolute blue cheese fanatic so needless to say, I was immediately captivated by the idea! My obsession with sandwiches however is just as strong and as soon as the idea of a black and blue sandwich crossed my mind there was no going down any other path! The steak is the starting point of this sandwich and you could use pretty much any cut of steak that you want. I figured that since it was going to be in a sandwich I would go for a nice tender rib eye which I barely seared on both sides over medium-high heat to get some nice charred gill marks on the outside while leaving the inside medium-rare and nice and tender. The steak would be perfectly fine if you seasoned it simply with salt and pepper but I went with a Montreal steak spice mix to add a bit of flavour. Next up is the blue cheese which I added in two forms both the crumbled blue cheese for the texture and a blue cheese dressing that would penetrate every crevice of the sandwich spreading its flavour. When thinking about steak I often think about caramelized onions and they seemed to fit into this sandwich just like home. To pay homage to the sandwiches origins, the black and blue salad, I added some greens and I tossed them in a tangy balsamic vinaigrette to complement and contrast the creamy blue cheese dressing . I have to say that biting into this sandwich is like biting into a piece of heaven! The flavours just dance in your mouth, all working together to form something greater than the sum of their parts. I was so intent of it that my sandwich disappeared before I knew it and I was looking for more. 1 pound steak such as rib eye, flank, etc. Pull the steak out of the fridge. Add the onions and the water and cook until completely tender, about 20-30 minutes, and set aside. Rub the salt and pepper (or steak spice blend) into the steak on both sides. Grill the steak for no more than 2 minutes per side over medium-high heat and let rest for 5 minutes before slicing it thinly. Assemble the sandwiches by placing the arugula tossed in balsamic vinaigrette on the bun followed by the sauteed onions, steak and blue cheese and dressing. Yum yum Kevin. Two of my favourite things – steak and blue cheese. I also like melting some good Quebec Bleu Benedictine on top of a perfectly grilled steak. Nothing better! You kill me! I die! Sorry to go all Rachel Zoe on ya, but that looks fantastic! I love black and blue salad so I know this will be awesome.Thanks for sharing and the picture is mouthwatering. Sandra: I just happen to have some Blue Benedictine in my fridge right now! My husband as been asking for a black and blue burger, I bet he would like this even better! Now that is my kind of sandwich! Perfectly cooked steak, beautiful caramelized onions, and blue cheese (my favorite). Beautiful Kevin! Oh my god, I have half a dry aged steak au poivre left over from dinner tonight and now I know EXACTLY what I'll be doing with it. This post came at the perfect time! Thank you! A perfect steak sandwich is a beautiful thing, and this one looks absolutely spot on! What a perfect sandwich! The blue cheese must pair so well with that perfectly cooked steak! Beef and blue cheese go so well together! OMG you are killing me! I adore Blue Cheese, but my husband hates it so I deprive myself. I am doing that no more! Gorgeous! I want this for lunch! The meat looks so succulent. Oh Wow, that look so amazing! I love the colours and the texture combinations. I'm knocked out- Black and Blue! That is one gorgeous sandwich! I just happen to have a ribeye steak in my fridge. I know what my husband and I are having for dinner tonight! 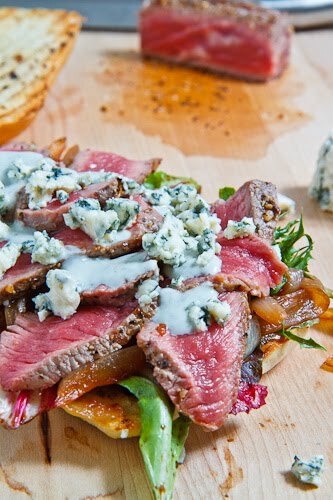 you can never go wrong with blue cheese and steak and an open face sandwich is just the way to have it. I've been craving a black and blue burger all day, but now I've seen this I'm craving a black and blue steak sandwich! Great looking recipe, thanks for sharing it …and making me hungry hehe. OH MY GLOB! I could make love to this sandwich.